iPad 4, iPad5, iPad Air 2, iPad Air, iPad mini 3, iPad Mini 2, iPad Mini Retina. 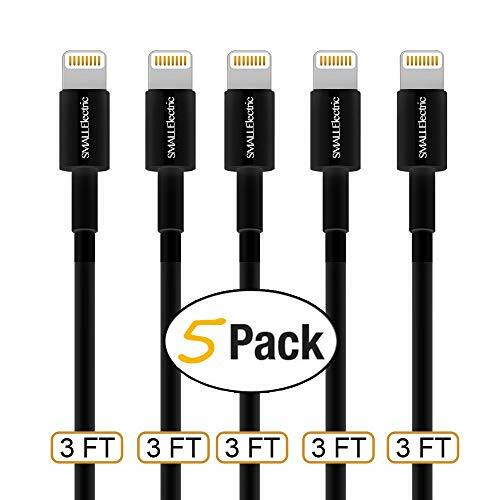 The 5-Pack Lightning Cables was made to complete CHARGE and SYNC for iPhone 6s/6s Plus, iPhone 6/6Plus, iPhone 5/5s/5c, iPad 4th Generation and iPad mini , iPod Touch 5th Generation & iPod Nano 7th Generation. Compatible with all Otterbox cases. Compatible with iPhone6s, iPhone6s Plus, iPhone 6 Plus,6, iPhone 5, 5c, 5s, iPod Nano 7, iPod Touch 5, iPad 4, iPad5, iPad Air 2, iPad Air, iPad mini 3, iPad Mini 2, iPad Mini Retina NOT compatialbe with iPhone 4, iPad2, iPad 3, iPod Nano 6, iPod Touch 4 or earlier versions. Smallelectric puts our customers FIRST! We truly believe that the happiness of our customers is the reason for a successful business. If for whatever reason you're dissatisfied with your order, simply contact us and we'll do whatever we can to make things right. All of our lightning cables come with a 100% Satisfaction Guarantee! If you have any questions about this product by SMALLElectric, contact us by completing and submitting the form below. If you are looking for a specif part number, please include it with your message.